E & T Fasteners' Nylon Heavy Duty Cable Clips are designed for cable and wire applications involving greater than usual loads or connections of a critical nature. 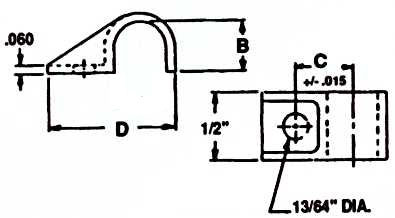 The rugged clip has reinforced side flanges for additional strength and rigidity. A compact design allows this clip to be used on corners, edges, or where space is limited. The clip has a hole for screw mounting. The clips are available in size range for cable 1/8" to 1/2" diameter cable.